Florida is supposed to be the “Sunshine State.” On Sept. 10, 2017, however, the sun was playing hooky. Where there were supposed to be bright rays of luminescence, instead were ominous clouds full with rain. The culprit: Irma, a Category 4 hurricane that ultimately pummeled Florida with massive storm surges and gale-force winds. As the storm loomed, authorities issued evacuation orders for 6.3 million Floridians who packed their cars with prized possessions, knowing that Hurricane Irma might raze their homes. Among the rescued belongings: clothing, irreplaceable photos, treasured heirlooms and beloved playthings. What many people forgot to pack, however, was a photo ID. 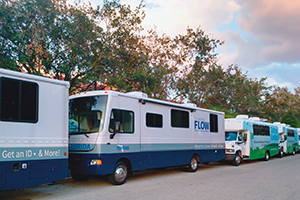 Florida Licensing on Wheels (FLOW) buses are ready to head to South Florida to assist after Hurricane Irma. The importance of identification became even more acute two weeks later, when Hurricane Maria ravaged Puerto Rico. Permanently displaced by the storm, thousands of Puerto Ricans sought refuge in Florida. In order to start a new life there, they needed housing and jobs—neither of which could be obtained without state-issued identification. It was a stark reminder: DMVs often are just as important in the wake of disasters as first responders; while the latter save lives, the former help rebuild them. “We’re one of the first steps people take toward making their life a little bit normal again,” Roby says. It’s an awesome responsibility. To meet it head-on, motor vehicle agencies and their partners should leverage lessons learned in jurisdictions like Florida, California and Texas, each of which was touched by natural disaster in 2017. In the wake of Hurricanes Irma and Maria, DHSMV’s first concern was its employees, with whom it communicated using automated text, email and voice messages. Caring for employees is as important as communicating with them. Following Hurricane Maria, the New Hampshire State Police (NHSP) took a team of state troopers to Puerto Rico to assist with cleanup and relief efforts. Back home, however, the agency faced its own challenges, including flash floods and ice storms, both of which plagued the Granite State in 2017. Because they’re sister agencies within the New Hampshire Department of Safety, NHSP and the New Hampshire Division of Motor Vehicles work closely to execute shared missions on a regular basis. They leveraged their strong partnership to great success during last year’s ice storms, when the agencies collaborated to obtain statutory waivers for commercial truck drivers to work more hours delivering heating oil to citizens in need. Assisting the public was just as important as assisting employees, according to Roby, who says DHSMV deployed four of its 13 mobile units to Orlando and Miami International Airports, where the State Emergency Response Team (SERT) with the Florida Division of Emergency Management (FDEM) had set up disaster relief centers to provide hurricane victims a one-stop shop for government services as they arrived in Florida from Puerto Rico. Operational from October through March, the mobile units were staffed by bilingual examiners who issued state IDs, driver’s licenses and vehicle registrations late into the evening seven days a week—in many cases for free, thanks to an executive order from the governor that temporarily waived select service fees for hurricane victims. DHSMV also raised per diems for hotel stays. In Orlando, for example, mobile units hosted employees from South Florida who needed accommodations but faced steep rates due to surging demand. Before Hurricanes Irma and Maria ripped through Florida and Puerto Rico, respectively, another Category 4 storm—Hurricane Harvey—besieged Houston. 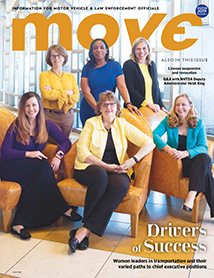 To assist victims, the Texas Department of Motor Vehicles leveraged what it believes is the most powerful tool in its tool belt: statute. Even as it utilized some statutes, the Texas DMV sought relief from others. For example, it asked the governor to temporarily suspend oversize/overweight permitting requirements for commercial vehicles responding to the disaster. In June 2008, the Cedar River in Cedar Rapids, Iowa, crested at 32 feet, which was 12 feet higher than its previous record. Because so many roads were underwater—only one major road, Interstate 380, remained open—the Iowa State Patrol mobilized in order to direct traffic, ensuring that emergency vehicles could get into the city and that evacuating residents could get out. Although the floods were devastating, the emergency response was remarkably smooth, according to Jones, who credits regular tabletop exercises during which stakeholders—including the Iowa State Patrol and the Iowa Department of Transportation’s Motor Vehicle Division—built relationships and rehearsed their roles. “What benefited us the most was the fact that there is a nuclear power facility about 10 miles northwest of Cedar Rapids. Because of that, we’re required to do very frequent disaster-response training,” Jones says. “We are not first responders, but we play an important role in making sure the statutes and regulations we have do not impede the rescue and recovery effort,” explains Brewster, who says statutory relief expedited Houston’s recovery by allowing more vehicles to deliver relief supplies and haul away debris. The Texas DMV also requested and received relief from vehicle titling and registration requirements in 58 storm-ravaged counties. One law from which the Texas DMV could have sought relief but didn’t was the requirement that it issue new titles for flood-damaged vehicles within five days. “We had the ability to request a waiver from the governor’s office to allow us more time, but we didn’t do that because we knew that the sooner we got flood-damaged vehicles branded, the better it was going to be for the consumer,” explains Brewster, who says the Texas DMV takes seriously its role as a consumer watchdog. To make sure it could quickly process salvage and rebuilt titles—which help consumers identify flood-damaged vehicles when they’re shopping for used cars—the agency ordered additional title paper and toner ahead of the storm and hired 25 temporary employees with the help of a $125,000 grant from AAMVA. 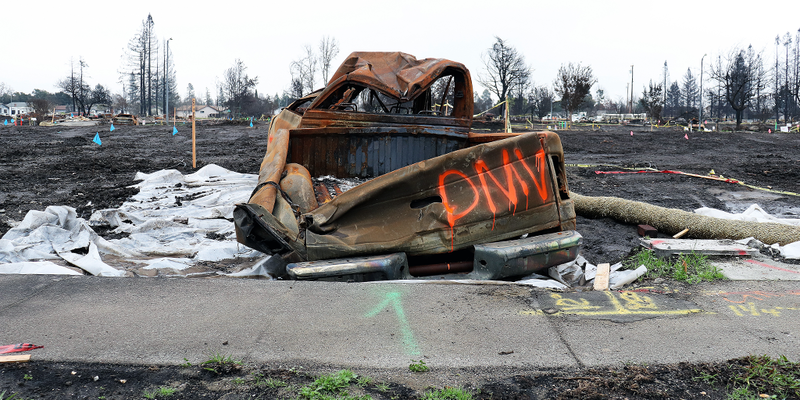 A DMV investigator inspects burned vehicles in Santa Rosa, California. More than 4,000 burned vehicles were identified, recorded and removed. After Texas, Florida and Puerto Rico faced damage from tremendous amounts of water, California burned, losing 1.4 million acres to wildfires that blazed from October through December 2017. As they were in Florida, disaster relief centers were a major asset to victims, many of whom turned to the California Department of Motor Vehicles for replacement IDs and driver’s licenses. All told, the California Governor’s Office of Emergency Services (Cal OES) sponsored a total of 17 “local assistance centers” (LACs) during the 2017 wildfires—nine of which were open simultaneously throughout the state. But the most important ingredient at LACs wasn’t equipment. Rather, it was people. When wildfires consumed 1.4 million acres of California terrain in 2017, the California Highway Patrol assisted local law enforcement with traffic management, crowd control and evacuations. It also worked closely with the California Department of Motor Vehicles to identify and remove more than 4,000 burned vehicles from devastated properties. “Collaboration and working together with the DMV is vital,” explains Falat, who says the massive effort to remove burned vehicles required constant communication and coordination between stakeholders, whose ultimate success is a credit to relationships that were formed long before the fires broke out. In order to recover, wildfire victims needed not only identification with which to access relief, but also safe land on which to rebuild their homes. So while some DMV staff manned LACs, investigators worked alongside partners— the U.S. Army Corps of Engineers, the Federal Emergency Management Agency (FEMA) and the California Highway Patrol (CHP), among others—to identify, record and remove more than 4,000 burned vehicles from scorched properties. “We wanted to prevent fraud so we didn’t have vehicles being cloned in other states,” explains California DMV Investigations Acting Chief Mary Bienko, who says investigators spent six weeks going door to door in search of vehicles, which they identified by cross-referencing visual cues and location data with the DMV’s registration database. 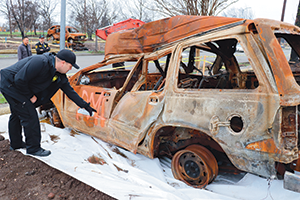 Once vehicles were verified, their remains had to be removed with other debris by a licensed salvage company, at which point property owners could submit insurance claims and begin the process of rebuilding. Finally, motor vehicle administrators should solicit knowledge from those who best understand their challenges and opportunities: their peers. Having a written plan for closing offices and continuing operations creates calm amid chaos. At the Texas DMV, for instance, employees knew exactly what to do as Hurricane Harvey approached; they deposited all the money from the day’s transactions, raised all computers off the floor in case of flooding, and positioned security cameras so they could observe offices remotely. Disaster response is a team sport. To make sure teams are cohesive, players should get to know one another before game day. In Texas, for example, the Texas DMV found statutory waivers easy to obtain during Harvey because it had already cultivated a strong relationship with the governor’s office. It also had close working relationships with law enforcement, insurance companies and motor carriers, as well as with its sister agency, the Texas Department of Public Safety. When stakeholders know each other, it generates interpersonal capital that can be spent with great effect during a disaster. Agencies can bring order to disorderly situations by developing in advance a communications plan. In Florida, for example, DHSMV relied on signage at closed DMV offices to direct citizens to the nearest open office; in some cases, it even stationed employees outside to hand out maps and give directions. And in Texas, the Texas DMV shared information via a dedicated webpage, social media, press releases and industry associations like the Texas Trucking Association (TXTA) and the Texas Independent Auto Dealers Association, both of which shared information with their members on the DMV’s behalf. One way to build relationships with stakeholders is to rehearse with them. In California, for instance, Cal OES regularly organizes tabletop exercises during which partners—including the DMV—verbally practice a statewide response to disasters. When employees feel cared for, they will care for customers. During Harvey, the Texas DMV organized several fundraisers to raise money for employees impacted by the storm. And in California, DMV administrators visited local assistance centers to personally thank employees working there. California DMV Director Jean Shiomoto sent employees thank-you letters to show her gratitude.